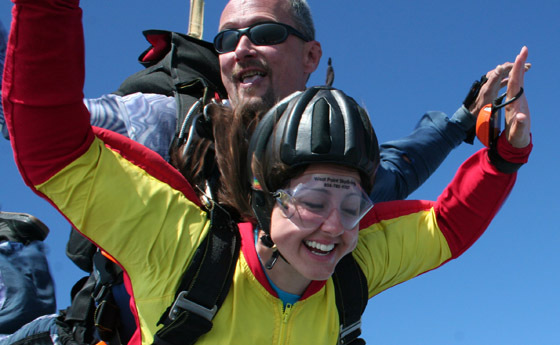 You are here: Home / Learning To Skydive / What Is Tandem Skydiving? The word tandem means, one behind the other. Tandem Skydiving derives it’s name from the fact that two skydivers are connected with one behind the other. For people who want to experience the world of skydiving tandem skydiving is the easiest and safest way to make a skydive. With about 15 minutes of training, you can experience the world of skydiving while connected to a USPA certified tandem instructor. After the training, your instructor will dress you in a tandem harness. The instructor will next put on a specially designed tandem parachute. This parachute is large enough to handle the weight of two skydivers. He is built to allow to people to fall at 120 MPH before it is fully deployed. After you have your on your harness and the instructor has their parachute, you will board the plane. You need to be careful to stay clear of the prop of the airplane. Be sure to stay with your instructor as you approach the plane. They will likely get in first and you will sit directly in front of them. This make the connect the two of you together much easier. A few minutes before jump time, the instructor will connect your tandem harness to his tandem parachute. This will be the most uncomfortable part of the skydive. The two of you will be connect fairly tightly. It shouldn’t be painful but needs to be firm. If you are overly uncomfortable or having difficultly breathing, tell your instructor. The two of you will scoot and waddle to the airplane door. You will get to see the open air for the first time. This is will likely induce a little panic. This is normal. You instructor will have told you how they want you to be in the door of the plane. Do what they’ve told you to do. This is the best thing you can do to avoid injury during the skydive. After a few seconds, you’ll leap from the plane. Once you leave the mostly quiet calm of the plane you’ll find yourself in a very foreign environment. It will be loud and windy. You won’t be able to speak to your instructor until the parachute opens. You will free fall for about 40 to 60 seconds. At a preplanned altitude the instructor will deploy the parachute or you may do it with the instructor assistance. The free fall is a feeling that you can’t explain. You need to experience it to understand it. You won’t really feel like you are falling. In reality, you are in a sense riding down a column of air. This will be the calm after the storm. After the parachute opens everything will be much quieter. You can talk to your instructor. They point out the drop zone and where you will land. They will likely offer to let you steer the parachute. You may want to do some big turns. They are fun but will shorten your parachute ride but getting you to the ground quicker. This is actually pretty easy but you need to do what the instructor tells you! They will tell you to pick of your feet. This will allow their feet to touch the ground first. If your feet touch down first, it will act as a pivot point and cause you to fall to the ground. Since the instructor is behind you, they will likely land on top of you. This could cause you to be injured. Remember to pick up your feet when they tell you to and you’ll have a great landing. Within seconds you’ll be disconnected and celebrating.